Many potential clients like to know what we are about. How did we get into sharing these German Shepherds with others? Here we will attempt to tell you a little about ourselves and our farm. The objective at our farm is to make available a healthy, high quality, and reasonably priced German Shepherd dog, that will provide you with many years of rewarding companionship. We use the internet tool of GORDENFARMS.COM to give you as much information as is reasonable to assist you in locating a match, for your desire to replace or acquire your first companion dog. 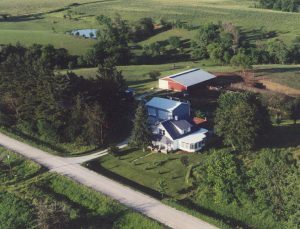 Gorden Farms, is a 300 acre project, started in 1994 by Judy and Lew Gorden as a retirement retreat. A funny thing happened: The project became our home and we became very involved in raising our beautiful dogs. We also raise grain, APHA horses (7) and crossbred angus cattle. For many years, while living in Urbandale, Iowa, we had White German Shepherds as house dogs. Our two original White Shepherds ( Thor & Reba) were our inspiration to expand to others the pleasure we had with them. We have now successfully placed German Shepherds from California to Michigan. We are both now retired from the communications industry and have found that time really does fly here on the farm. We have found that using the Web gives us access to many people who spend time researching potential sources for their purchases prior to finalizing a provider. To better meet your specialized needs, we now use the following site for our APHA paint horses. Here is a picture of a mare and her filly. Sugar is 4 year old paint born at Gorden Farms. Spice is a 2002 model.